Flipped classrooms require students to take responsibility for their own learning outside of class. Our favorite method for motivating students to engage in out-of-class work is Just-in-Time Teaching. The method is remarkably flexible: We implement JiTT as follows, but you can hack our approach–that is make it your own–in a number of ways. 2. Embed Assessment – Pose 3 questions to students about the coverage assignment- 2 questions specific to the content and one feedback question. 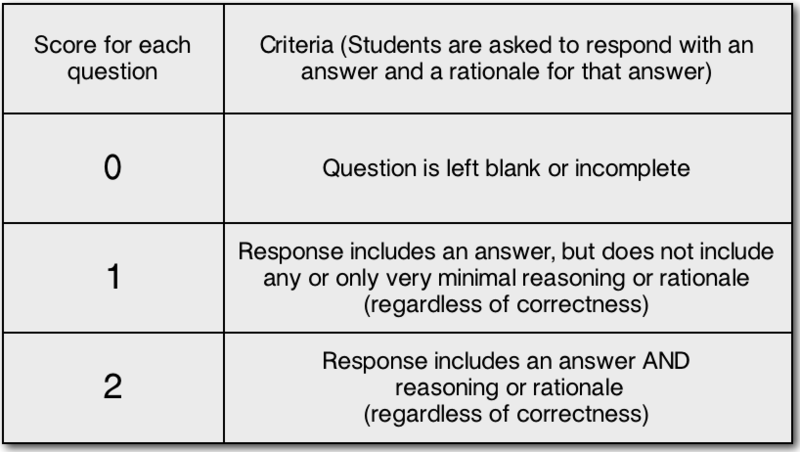 For each question, students must include a rationale or delineate the reasoning for their responses. 4. Address themes in student difficulty or misunderstanding during class time – We do this using Peer Instruction but you can use any activity to do this, really. We are always careful to design the first two JiTT questions in a way that goes beyond fact recognition or recall. Here’s a 2:40 minute video we made that begins with a 40 second overview of JiTT and then provides a simple example of the types of questions we like to use in our JiTT exercises. 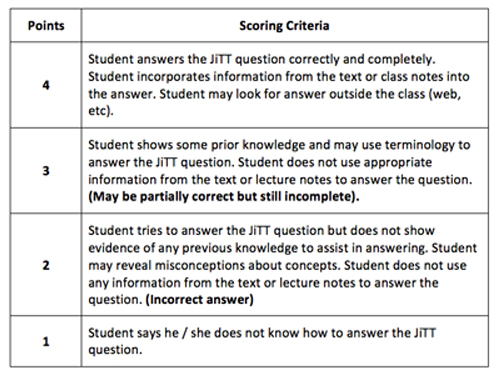 One of the most frequently asked questions we get about JiTT is how we score students’ assignments. We always give students credit (points) for doing their assignments and we base the scoring on effort not on correctness. For JiTT, we want to emphasize student effort and reward development of reasoning, not just getting the right answer. We provide feedback on the “correct answer” in JiTT and we do grade homework on correctness. Here is our rubric for evaluating their effort on JiTT exercises. Many instructors do grade JiTT exercises on correctness – Peer Instruction Network member and Director of the Academy for Teaching and Learning at North Carolina A & T, Scott Simkins recently pointed me to a set of fantastic resources on Just-in-Time teaching here. 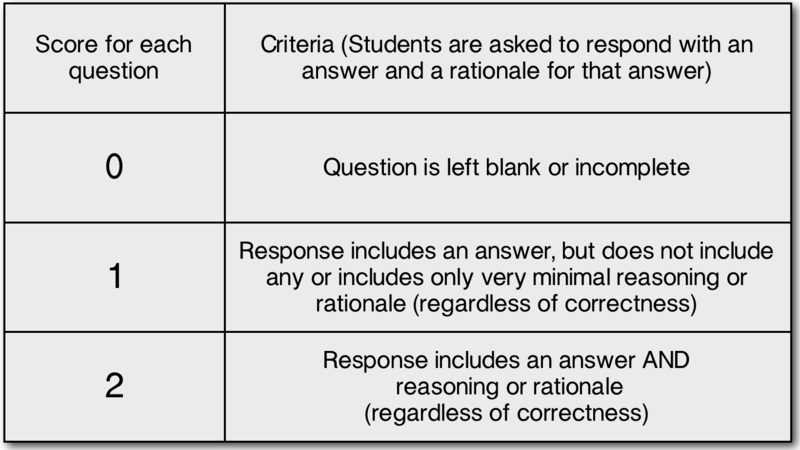 I pulled out the below rubric by Kathy Marrs (which appears to be adapted from de Caprariss et al., 2001). JiTT experts recommend sharing the rubrics you will use to evaluate work with students at the beginning of the semester. If you have a hack that you like to use for JiTT, include it in the comment section. I’ve been using JiTTs this semester. I tend to use them every 2 weeks or when we start a new chapter. Thus, several classes are devoted to one set of answers. Also, my last question is a bit different (maybe got from Mark and Scott’s book?). I ask, “What did you find surprising, interesting, or confusing about the readings?” If I get a many “confused” it gives me a sense that many, are, well, confused, but it there are only a few, I’ll often mention in class the surprising or interesting parts that students found. I’d like to think that this reinforces the point that I take them seriously. As Mark suggests, I put some of the typical ones on several slides that I show to the class to give students a sense of where their peers are.